The vacation certificate guarantees you 3 days & 2 nights in deluxe hotel accommodations in a choice of one of 24 destinations listed. Your Certificate is redeemable for a Restaurant Savings Book, providing you with the opportunity to order $1.000 worth of coupons of your choice from your favorite restaurants and fast food chains. 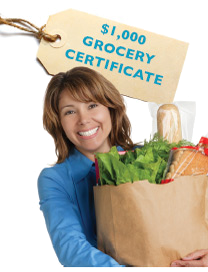 This Certificate is redeemable for a Grocery Savers Book, providing you with the opportunity to order $1.000 worth of brand name coupons of your choice. Customer Agreement Last Updated On: January 1, 2009 PLEASE READ THIS AGREEMENT CAREFULLY; THIS IS A BINDING AGREEMENT. This Customer Agreement (the "Agreement") describes the terms and conditions applicable to your relationship with ARI Warranty Group LLC. ("WarrantyofAmerica.com") in connection with your extended service plan and the website located at www.WarrantyofAmerica.com (the "Website"). IF YOU USE OR CONTINUE TO USE THE WEBSITE, YOU AGREE TO THE TERMS OF THIS AGREEMENT. IF YOU DO NOT AGREE WITH THE TERMS OF THIS AGREEMENT, YOU ARE NOT PERMITTED TO USE THE WEBSITE. EXTENDED SERVICE PLAN. Your extended service plan is issued Companion Property & Casualty Insurance Group in all states. Companion Property & Casualty Insurance Group is defined and referred to as "Obligor." In all states, extended service plans are administered and serviced by Tier One Warranty LLC. ("Administrator"). You understand and expressly agree that your extended service plan and all rights, obligations and limitations in connection with your extended service plan are covered, controlled and governed by the Service Agreement between you and the Obligor. SERVICE REQUESTS. To file a service request under your extended service plan, call the Administrator toll free at 1 (866) 545-0980 to request service on eligible products. All requests for service, questions and information relating to coverage should be directed to the Administrator. See the Service Agreement for your rights, obligations and limitations under the extended service plan. AMENDMENTS/CHANGES TO THIS AGREEMENT. WarrantyofAmerica.com may amend this Agreement at any time by posting the amended Agreement on the WarrantyofAmerica.com website and/or providing notice to the email address attached to your account. For your convenience, the date of last revision is included at the top of this page. COMMUNICATIONS WITH THIRD PARTIES. Your dealings or communications with any party other than WarrantyofAmerica.com, including without limitation your dealings with the Obligor and the Administrator are solely between you and that third party. Under no circumstances will WarrantyofAmerica.com be liable for any goods, services, resources or content available through such third party dealings or communications, or for any harm related thereto, even if such communications were initiated through the WarrantyofAmerica.com website. MEMBERSHIP ELIGIBILITY. You represent and warrant that (a) all information you submit to WarrantyofAmerica.com through the website or otherwise is truthful and accurate, and that you will maintain and update that information for the duration of your membership with WarrantyofAmerica.com; (b) you are 18 years of age or older; (c) that you have engaged in no fraud or misrepresentation in connection with any information you supply to WarrantyofAmerica.com; and (d) you are a resident of the United States or a member of the U.S. military or employee of the U.S. government living abroad. PAYMENT. For the duration of your membership with WarrantyofAmerica.com, you agree that you will pay WarrantyofAmerica.com a monthly agreement charge and any applicable taxes for the extended service plan issued by the Obligor and administered by the Administrator ("Monthly Agreement Charge"). Where required, you must provide WarrantyofAmerica.com with complete and accurate billing information, including name, address, telephone number, e-mail address, credit card information and where applicable, a valid promotional code. By providing a credit card number, you grant WarrantyofAmerica.com the authority to bill Monthly Agreement Charges to that credit card. Monthly Agreement Charges will be billed automatically to that credit card while you are a WarrantyofAmerica.com member. For assistance with billing questions, please contact WarrantyofAmerica.com at www.WarrantyofAmerica.com. WarrantyofAmerica.com reserves the right to modify and/or increase the Monthly Agreement Charge in accordance with the terms and conditions of the Service Agreement. CANCELLATION. You may cancel your membership with WarrantyofAmerica.com at any time for any reason. To cancel this Agreement, you must provide notice to WarrantyofAmerica.com by calling 1-877-746-4962. If you cancel this Agreement, you will receive a refund of the current Monthly Agreement Charge unless you filed a claim during that month this Agreement is cancelled. This Agreement will automatically terminate for non-payment of the full Monthly Agreement Charge by the billing due date. WarrantyofAmerica.com may cancel your membership with WarrantyofAmerica.com at any time for any reason, by providing notice to the email address you provided to us. If we cancel, you will receive a refund of the current Monthly Agreement Charge. Your rights under your extended service plan will automatically terminate upon the cancellation of your membership with WarrantyofAmerica.com. DISCLAIMERS AND LIMITATION OF LIABILITY. ANY EXTENDED SERVICE PLAN, SERVICES AND THE WEBSITE OFFERED BY WARRANTYOFAMERICA.COM ARE PROVIDED TO YOU ON AN "AS IS" "AS AVAILABLE" BASIS WITHOUT WARRANTY OF ANY KIND EITHER EXPRESS OR IMPLIED, INCLUDING BUT NOT LIMITED TO THE IMPLIED WARRANTIES OF MERCHANTABILITY, FITNESS FOR A PARTICULAR PURPOSE, AND NON-INFRINGEMENT. WARRANTYOFAMERICA.COM MAKES NO REPRESENTATIONS OR WARRANTIES AS TO THE QUALITY OR AVAILABILITY OF ANY EXTENDED SERVICE PLAN, SERVICES OR THE WEBSITE, INCLUDING WITHOUT LIMITATION, ANY EXTENDED SERVICE PLAN ISSUED AND/OR SERVICED BY THE OBLIGOR AND/OR THE ADMINISTRATOR. TO THE MAXIMUM EXTENT PERMITTED BY LAW, WARRANTYOFAMERICA.COM DISCLAIMS ALL LIABILITY, WHETHER BASED IN CONTRACT, TORT (INCLUDING NEGLIGENCE), STRICT LIABILITY OR OTHERWISE, AND FURTHER DISCLAIMS ALL LOSSES, INCLUDING WITHOUT LIMITATION INDIRECT, INCIDENTAL, CONSEQUENTIAL, OR SPECIAL DAMAGES ARISING OUT OF OR IN ANY WAY CONNECTED WITH ANY EXTENDED SERVICE PLAN, SERVICES OR THE WEBSITE, EVEN IF WarrantyofAmerica.com HAS BEEN ADVISED OF THE POSSIBILITY OF SUCH DAMAGES. WITHOUT LIMITING THE FOREGOING, WARRANTYOFAMERICA.COM’S AGGREGATE LIABILITY TO YOU SHALL NOT EXCEED THE AMOUNT PAID BY YOU TO WARRANTYOFAMERICA.COM DURING THE SIX (6) MONTHS PRIOR TO THE DATE THE APPLICABLE CAUSE OF ACTION AROSE. INDEMNITY. You agree to indemnify, defend and hold WarrantyofAmerica.com, its subsidiaries, and affiliates, and their respective officers, agents, partners and employees, harmless from any loss, liability, claim, or demand, including reasonable attorneys' fees, due to or arising out of your breach of this Agreement. ARBITRATION. YOU UNDERSTAND AND AGREE THAT ALL CLAIMS, DISPUTES OR CONTROVERSIES BETWEEN YOU AND WarrantyofAmerica.com, AND ITS PARENTS, AFFILIATES, SUBSIDIARIES OR RELATED COMPANIES ARISING OUT OF OR IN ANY WAY CONNECTED WITH ANY EXTENDED SERVICE PLAN, SERVICES OR THE WEBSITE, INCLUDING BUT NOT LIMITED TO TORT AND CONTRACT CLAIMS, CLAIMS BASED UPON ANY FEDERAL, STATE OR LOCAL STATUTE, LAW, ORDER, ORDINANCE OR REGULATION, AND THE ISSUE OF ARBITRABILITY, SHALL BE RESOLVED BY FINAL AND BINDING ARBITRATION IN ACCORDANCE WITH THE LAWS OF THE STATE OF DELAWARE AT A LOCATION DETERMINED BY THE ARBITRATOR. ANY CONTROVERSY CONCERNING WHETHER A DISPUTE IS ARBITRABLE SHALL BE DETERMINED BY THE ARBITRATOR AND NOT BY THE COURT. JUDGMENT UPON ANY AWARD RENDERED BY THE ARBITRATOR MAY BE ENTERED BY ANY STATE OR FEDERAL COURT HAVING JURISDICTION THEREOF. THIS ARBITRATION CONTRACT IS MADE PURSUANT TO A TRANSACTION IN INTERSTATE COMMERCE AND ITS INTERPRETATION, APPLICATION, ENFORCEMENT AND PROCEEDINGS HEREUNDER SHALL BE GOVERNED BY THE FEDERAL ARBITRATION ACT ("FAA"). NEITHER YOU NOR WARRANTYOFAMERICA.COM SHALL BE ENTITLED TO JOIN OR CONSOLIDATE CLAIMS IN ARBITRATION BY OR AGAINST OTHER CONSUMERS OR ARBITRATE ANY CLAIM AS A REPRESENTATIVE OR MEMBER OF A CLASS OR IN A PRIVATE ATTORNEY GENERAL CAPACITY. THE PARTIES VOLUNTARILY AND KNOWINGLY WAIVE ANY RIGHT THEY HAVE TO A JURY TRIAL. MISCELLANEOUS. If any provision of this Agreement is held to be invalid or unenforceable, such provision shall be struck and the remaining provisions shall be enforced. Headings are for reference purposes only and in no way define, limit, construe or describe the scope or extent of such section. WarrantyofAmerica.com's failure to act with respect to any failure by you or others to comply with this Agreement does not waive WarrantyofAmerica.com's right to act with respect to subsequent or similar failures. This Agreement sets forth the entire understanding and agreement between you and WarrantyofAmerica.com with respect to the subject matter hereof. Any cause of action or claim you may have with respect to this Agreement or WarrantyofAmerica.com's services must be commenced within six (6) months after the claim or cause of action arises or such claim or cause of action shall be barred. VIOLATIONS AND ADDITIONAL POLICIES. WarrantyofAmerica.com reserves the right to seek all remedies available at law and in equity for violations of this Agreement. USE OF MATERIALS ON THIS WEBSITE. WarrantyofAmerica.com invites you to view and use a single copy of the Website. You agree not to license, create derivative works from, transfer, sell or re-sell any information, content, or services obtained from or through the Website. LINKS FROM THIS WEBSITE AND USE OF MARKS. The Website may contain links to websites operated by other parties. WarrantyofAmerica.com provides these links to other websites as a convenience, and use of these sites is at your own risk. The linked sites are not under the control of WarrantyofAmerica.com, and WarrantyofAmerica.com is not responsible for the content available on the other sites. Such links do not imply WarrantyofAmerica.com's endorsement of information or material on any other site and WarrantyofAmerica.com disclaims all liability with regard to your access to and use of such linked websites. TRADEMARKS. WarrantyofAmerica.com is a service mark of ARI Warranty Group LLC.. Unauthorized use of any WarrantyofAmerica.com trademark, service mark or logo may be a violation of federal and state trademark laws. COPYRIGHT. The Website is protected by U.S. and international copyright laws. Except for your use as authorized above, you may not modify, reproduce or distribute the content, design or layout of the Website, or individual sections of the content, design or layout of the Website, without WarrantyofAmerica.com's express prior written permission. LOCATION. The Website is operated by WarrantyofAmerica.com from its offices in the United States. Those who choose to access the Website from locations outside the United States do so on their own initiative and are responsible for compliance with applicable local laws. MINORS/CHILDREN. The Website is not directed toward minors/children under 18 years of age nor does WarrantyofAmerica.com knowingly collect information from minors/children under 18. If you are under 18, please do not submit any personally identifiable information to WarrantyofAmerica.com. PRIVACY NOTICE. By using the Website, you acknowledge that WarrantyofAmerica.com may collect, use and disclose your information as described in our Privacy Notice. EMAIL. Email submissions over the internet may not be secure. Please do not submit any personal confidential information via email correspondence to WarrantyofAmerica.com.